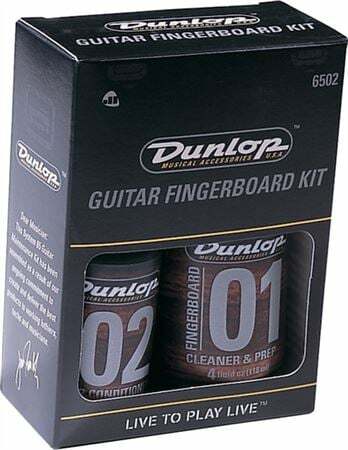 Clean and condition your guitar's fingerboard with the Dunlop 6502 Guitar Fingerboard Care Kit! A guitar’s fingerboard is often overlooked while cleaning, but is a part that collects a good amount of dirt, grime, sweat and more. The Dunlop 6502 fingerboard care kit includes 6524 Fingerboard Cleaner and Prep, 6532 Deep Conditioner Oil, Micro Fine fret polishing cloth, 100 percent cotton polishing cloth, and care instructions. Great product, cleans and rejuvenates the fretboard. Using this product, helped me get the hard to remove stuff of the fretboard, I did use a toothbrush as well, but great product overall!!! Highly recommended! Cleans well, and made my rosewood fingerboard look like ebony which is awesome! The oil applicator is a little finicky, but the products work great and the fretboard is cleaner and glossier.